I-NAC Eye Drops is a sterile, topical, nonsteroidal anti-inflammatory (NSAID) prodrug for ophthalmic use. Each mL of I-NAC Eye Drops contains 1 mg of nepafenac. Nepafenac is designated chemically as 2-amino-3-benzoylbenzeneacetamide with an empirical formula of C15H14N2O2. Primary packing - 5ml White Poly bottles White caps &Nozzles. 18 months from the date of manufacturing. Store at 2ºC - 25 ºC in a dark place. Do not allow to Freeze. I-NAC Eye Drops contains Nepafenac (0.1%), a nonsteroidal anti-inflammatory and analgesic prodrug. After topical ocular dosing, nepafenac penetrates the cornea and is converted by ocular tissue hydrolases to amfenac, a nonsteroidal anti-inflammatory drug. Amfenac is thought to inhibit the action of prostaglandin H synthase (cyclooxygenase), an enzyme required for prostaglandin production. 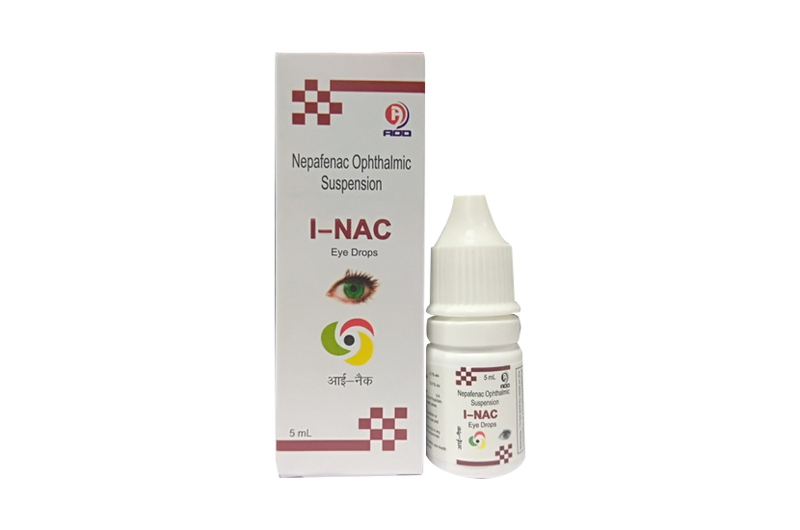 I-NAC Eye Drops is indicated for the treatment of pain and inflammation associated with cataract surgery. I-NAC Eye Drops is contraindicated in patients with previously demonstrated hypersensitivity to any of the ingredients in the formulation or to other NSAIDs. Shake well before use. One drop of I-NAC Eye Drops ophthalmic suspension should be applied to the affected eye(s) three-times-daily beginning 1 day prior to cataract surgery, continued on the day of surgery and through the first 2 weeks of the postoperative period. I-NAC Eye Drops is supplied in one 5 mL Opeque Polethylene Bottle packed with printed labeled in a unit carton and, Such 25 Carton Packed in a Shrink Sleeves.Such 12 shrinks packed in a shipper.